Remember the Choco Nut Drops? Well, the lovely Ari from Frugally Rich Life commented on that post that she can no longer eat coconut in any form. Can you imagine? Ouch. But, she is a peanut butter lover like me, and asked if I could possibly do a gluten-free vegan riff on these gorgeous peanut butter and jelly bars from Eats Well With Others with no coconut. Hey – it’s my first recipe request! Thanks, Ari. I’m happy to oblige. I can’t say these have kiddo approval. So far, he’s refused to try them on the grounds that he is sure he no longer likes strawberry jelly. Next time I’ll make them with grape, because I know they sure have MY approval, and the approval of several other taste testers. In fact, the pan has been decimated enough that I’m pretty sure I can’t get a decent picture of a cut piece. You’ll have to survive with the shot of my old and dingy pan. Preheat oven to 350°. Grease an 8″ x 8″ pan. In a medium bowl, beat together the shortening and sugar until light and fluffy. Add the flax egg, peanut butter, and vanilla and beat until smooth. Add all the dry ingredients and beat until a thick dough forms. Reserve 1/3 of the dough. Press remaining dough into prepared pan. Spread dough with jelly. Glob the reserved dough evenly over the the jelly. Sprinkle on the peanuts. Bake for approximately 30 minutes, until top is lightly browned. Cool completely before removing from pan. For more slightly indulgent recipes, be sure to visit Slightly Indulgent Tuesdays. 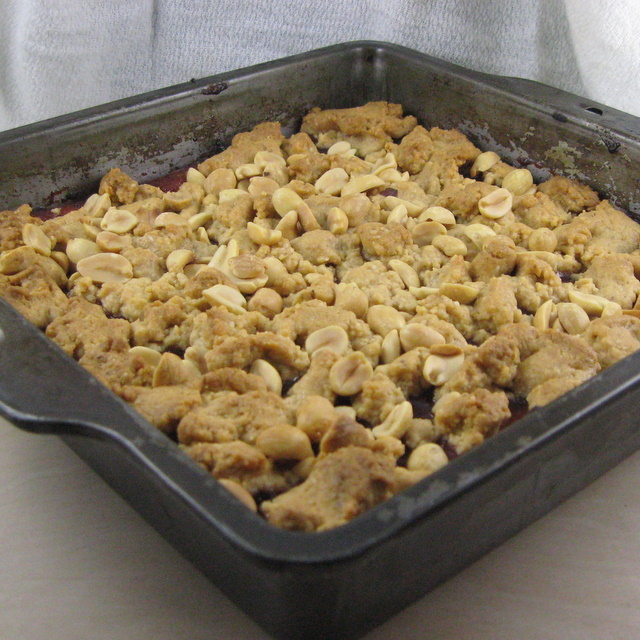 This entry was posted in desserts, flax seed, nightshade-free, nuts, peanut butter, vegan and tagged bar cookie, jelly, peanut butter, recipe. Bookmark the permalink. WOW! These sound great! Peanut butter and jelly work so well together! Thanks. I can’t take any credit for the idea. But, you’re right, it is a delicious combination. Mmmm…..
Whoa! these look great! On my next post I’ll be sure to mention them so that my GF readers will know about them! these look really good – I’ll have to give them a try. I’ll try to send people in your direction, but I’m not very good with technical things! Thanks Christine. I’ll check out your blog as well! Wow! My husband will love these – he’s pretty much game for anything with peanuts in it! I’m thinking sorghum or amaranth might work well. Oat flour could work, as well. Amaranth is technically a seed, so I might try that next and see how the tummy does with it. I think I would cry for days and days if I was told I couldn’t eat coconut anymore. Next to my boyfriend, it’s my favorite thing in the ENTIRE world! Thank you! Your blog is one I follow as well. So glad you like my recipes! I’m so glad to know it worked for you with those changes. So, you just added more arrowroot instead of the millet? It didn’t get too starchy doing that?